Thanks to its mild flavor, cauliflower is a great, low carb substitute for starchy foods like mashed potatoes. Enjoy this healthy-ish side with roast chicken or pan-seared steak. Boiling the cauliflower like you would do with potatoes results in ultra-creamy texture. This recipe mixes the fluffy mashed vegetables with cottage cheese, garlic and Parmesan for flavor and added richness. 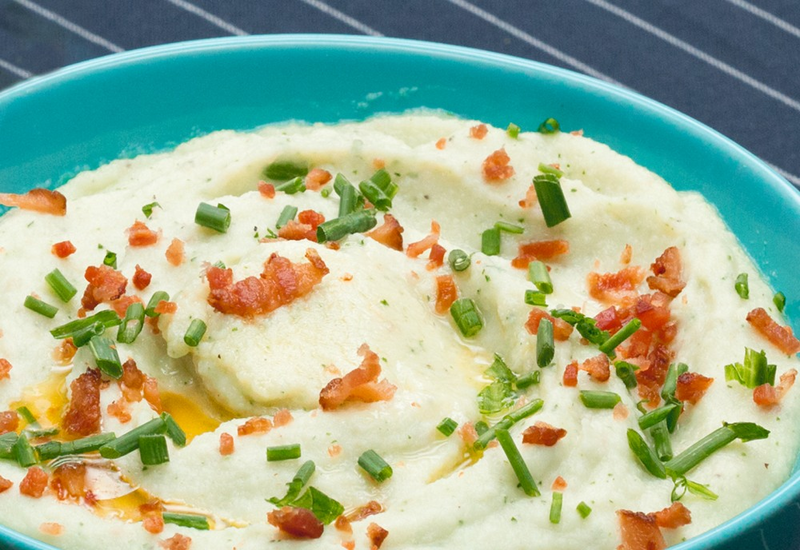 Top with the classic bacon and chive combo (or in this case, low calorie turkey bacon) for a diet-friendly side dish with all of the characteristics of your favorite mashed potatoes. Try different toppings or mix-ins with the mashed cauliflower. Swap the cottage cheese for creamy ricotta or mascarpone. Sprinkle with crispy onions, chopped green onions, grated cheddar cheese, crumbled pork or vegan chorizo, or a dollop of Greek yogurt. Per Serving: 122 calories; 7g fat; 8.5g carbohydrates; 8g protein; 24mg cholesterol; 463mg sodium. Making mashed "potatoes" out of cauliflower is my favorite way to eat this vegetable. Normally, I would just add butter, cream cheese, and Parmesan to it, but this recipe give you a more filling alternative. I liked the turkey bacon, but will stick to low-sodium bacon from here on out; cause I love bacon so much. Liked the cottage cheese in here. It good that I can use it for other recipes as I usually just eat a spoonful or two per day when I have food cravings during meals. This recipe is awesome. I'm considering going on a ketogenic diet, and I've been trying low-carb high-fat high-protein recipes over the past few weeks. Some cauliflower substitute recipes still taste like cauliflower, but I swear that I couldn't tell the difference between this and mashed potatoes. The chives and parsley give this an herb-y taste, perfect for anyone not that into cauliflower flavor. The butter and bacon are also a must. The texture came out very smooth, tasted great. I really enjoyed this recipe. If you close your eyes 👀 it does tastes very close to mashed potatoes. I'd never used cottage cheese in my cauliflower mash. That was a nice twist. Instead of blending the turkey bacon together with the cauliflower, I just added chopped bacon for topping. The cottage cheese gives it a really creamy consistency, which I love. For best results, definitely use a high speed blender. I found that using a regular blender leaves some chunks. I left off the parsley and the chives just because I forgot to buy them and I don't miss them at all. I used regular bacon (precooked, just warmed up) and I was so surprised at the yummy taste of this dish! Was easy and quick and I will make again! I did not have parsley or chive so I left them out, but it still turned out great! Better yet, the kids loved it. It tastes more like humus than mashed potato, kids dipped pretzels into it. It is the most popular dish on my thanksgiving meal!